Writing Java Objects or keeping the state of Objects into DataBase or Files (In Binary Format) is known as Serialization or Marshalling or deflating. Reading Java Objects back in Binary Format from file or Database is known as DeSerialization or UnMarshalling or inflating. Transient : If any variable is defined by using keyword “transient”, then object will not serialize that variable. During deserialization default value of that datatype will be set. Static : as static variables are class level variables, so it is not serialzed as the object state. 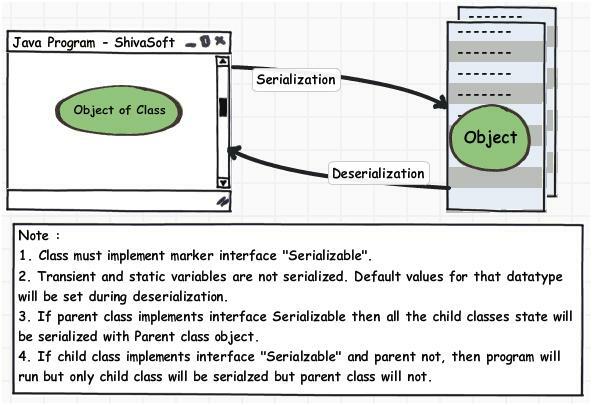 Parent class implements interface “Serializable“ and child class extends that, so child class automatically gets serialized. Variable “flatNo” is transient and therefore it is not serialized. further read – Externalization API of Java.